The electricity sector and industrial plant in general, are currently faced with the challenge of being increasingly competitive, this making higher levels of availability and reliability, key factors as regards management of installations. In this context, in-service inspection is of fundamental importance as regards guaranteeing the structural integrity of the major components, thus avoiding the appearance of failures during service and contributing to optimisation of the aforementioned factors, i.e., availability and reliability. It should be remembered, however, that in-service inspection implies not only high costs but also a loss of electricity production during plant outages for revision. Consequently, if the objetive is to improve the availability of the installation and maintain appropriate levels of reliability, it will be necessary to implement a strategy aimed at optimising management of inspections. This optimisation implies designing effective and dynamic inspection plans, simplifying management of inspections and making them more agile, and evaluating the results obtained as reliably as possible, thus allowing the remaining lifetime of the equipment and components to be adequately managed. With a view to contributing to achievement of these objectives, Tecnatom has developed and applied at Spanish power and process plants the principles described above, which culminates in implementation of an intelligent system for inspection and remanent lifetime management. Quite clearly, the design of such a system for a certain power or process plant must start with the compilation of all the information considered to be of key importance, due to the fact that the tool should be developed tailored for each particular installation. Design data: drawings, materials specifications, assembly and quality assurance reports and other types of calculations. Operating data: operating temperatures, pressures and times, type and number of start-ups, temperature gradients for each type of start-up, etc. Quality data: failures, damage, accidents, repairs, replacements and inspections. The aforementioned data will allow performing a series of preliminary studies, with a view to carry out an initial evaluation of the components potentially most deteriorated, and which will, therefore, be assigned higher priority in subsequent scheduling of inspections. Degradation mechanisms survey: which are the degradation mechanisms acting the plant and which are the components more affected, i.e. the critical areas of the installation. Theoretical calculation of remaining lifetime: Such calculations make it possible to estimate the more degraded components and the tolerance to damage of a component. On completion of the aforementioned studies, an initial assessment of component status will be produced, which will be used to assign priorities in relation to inspection. Thus, it allows to design suitable inspection plans and manuals, applying the most reliable techniques for detection and evaluation of the different degradation phenomena and potential defects to the most critical components and areas. In other words, it is possible to optimise the inspection. Later on those plans and manuals are integrated in the management tool. Mention has been made of the importance of in-service inspection as a basic tool for suitable management of the remaining lifetime of major components. Nevertheless, the different stages of an inspection imply a large volume of information, which is difficult to handle and interpret overall. Consequently, it is vitally important that a module be developed to facilitate and optimise inspection management, using the results obtained as input: location and dimensions of indications and defects, microstructural status, diameters, thickness, hardness, etc., where they will be processed in order to assess the status of the component. In order for the inspection manager to be able to efficiently manage the different stages associated with the inspection, it will be necessary for consideration to be given to the following phases: scheduling, requests for proposals, performance, documentation and evaluation. In this respect, the inspection module was developed taking into account the strategy and practices most widely used at industrial plants for inspection management. Effective scheduling requires that the Inspection Plan drawn up during the first phase be previously incorporated in the system. The Inspection Plans and Manuals detail all the geometric characteristics of the component, materials, areas to be inspected, the mechanisms expected in each such area, and the inspection and testing techniques applicable in each case, accompanied by sketches or drawings of the component and by additional observations on how the inspection should be performed, if appropriate. Figure 1 shows how that plans are included in the manager tool. Fig 2: Inspection Scheduling. The upper part of the figure displays the selection buttons. The middle shows the techniques and scope. The front window allows updating the time file in which intervals between inspection are stored. The reference Inspection Plan must be adapted to the specific needs of each overhaul, this process being known as inspection scheduling. The system makes it possible to perform this scheduling manually, automatically or cyclically, or even intelligently, as will be seen below. Figure 2 presents the programming main screen. Once the inspection has been scheduled and validated by those responsible for maintenance, requests for proposals should be issued for contracting of inspection services. In order to accelerate this stage, the lists containing the components and areas to be inspected may be obtained, along with the techniques applicable to each. 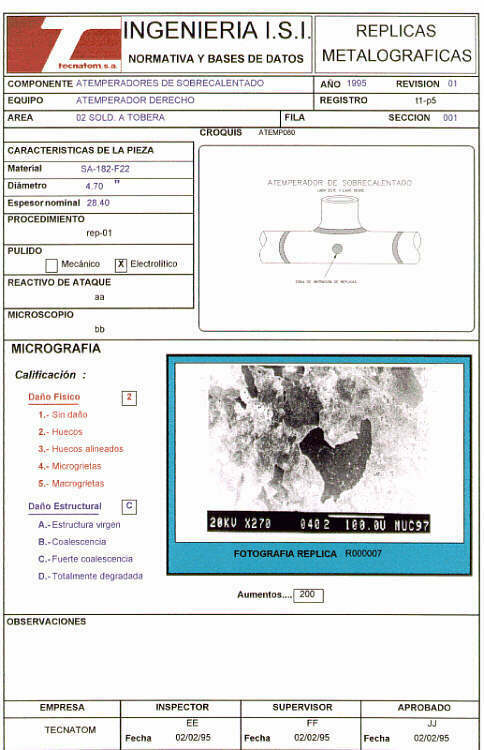 Following the issuing of these requests and awarding of the work, performance of the inspection itself will begin, this requiring the preparation of a considerable amount of material, either by the plant or by the inspectors who have to carry out the inspection, this including work sheets, sketches showing the location of the different areas, etc. 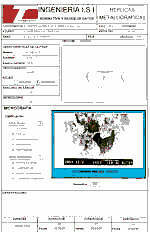 The system automatically issues the work sheets for all the components and techniques scheduled, as well as the associated sketches. The figure 3 is an example of how those work sheets look like, in this case the technique is replica analysis. The work sheets also make it possible to document the results obtained and incorporate them in the system easily and efficiently. The inspection results are presented in the system either numerically, as in a worksheet (figure 4), or graphically as it is shown in figure 5. In this figure, it is possible to appreciate that results are more digestible and information is easily comprehensible. Fig 4: Inspection result numerically presented Fig 5: Thickness results graphically presented Fig 6: Acceptance Criteria. Magnetite Thickness' Parameters.The upper left part of the figure shows the available criteria and their explanation. In the middle and bottom the acceptance values and meters needed for the calculation. The information obtained during the inspection must be evaluated, along with the results provided by metallographic analysis and destructive testing, with a view to realistically estimating the remaining lifetime of the component and obtaining an estimate of associated lifetime consumption; this is sometimes achieved directly and on other occasions indirectly, i.e., on the basis of correlation, evolutionary studies, that is to say through comparison with other historical data. The evaluation is based on establishing a series of acceptance criteria for each technique and on predicting when the component may be reaching a significant degree of ageing or deterioration. All the acceptance criteria are included not only as information but as dynamic part of the system, being the basis of the intelligent programming tool. The end-user is able to vary the criteria's values according to the plant policy or needs. In figure 6 an example of these criteria are included. Thickness: based on historical data and by means of correlation, the system is able to calculate the loose of thickness rate and then predicting the operating time till the minimum thickness established by the acceptance is reached. Magnetite layer: the system calculates the effective operating temperature using the value of the magnetite's layer thickness. Joining this temperature to the rate of loose of thickness it is performed a creep coded-based remaining lifetime calculation. Replica: Depending on the replica's classification (damage, microestructure degradation) there are correlation implemented that allow estimating life consumption of the component. Hardness and Strain: as well as for the thickness' case, it is used historical data available to extrapolate the time to reach the critical hardness or strain established by the criteria. As well as in the case of inspection, the results of the evaluations are presented numerical and graphically in different ways as evolution or tendency graphics, comparison of results, minimum remaining lifetime of component/area, etc. Figure 7 shows an example of thickness evolution in a certain area. All calculations are updated with each plant revision, providing information on the degree of criticality of the components. In this way priorities are assigned to the most seriously damaged components and forthcoming revisions may be automatically scheduled, as it shall be see below. Automatic scheduling is based on the results obtained from assessment of remaining lifetime and on application of the different acceptance criteria. This automatic scheduling is divided into two levels of priority and an advising tool. The first level includes those components which have been declared unacceptable in relation to one of the established criteria, and which have not been replaced. Regardless of whether repairs had been carried out or of whether no additional action had been taken, it is usual to propose inspection during the next revision, with a view to verifying the integrity of the components in question, for example repair welds, possible defect growth, etc. The system includes all these components for the next revision, and the person responsible for maintenance will have to decide whether to accept all of them or eliminate from the inspection program those that he considers to be unimportant. The second level includes analysis of the possible evolution of material and component properties, and determination of which might not be acceptable in the next revision or within a certain period defined by the user, with a view to including them in the inspection plan. Obviously, an essential piece of information to be used as input is the number of hours of operation to the next revision or considered period. These criteria may also be used to provide the ideal period between revisions. Finally, the advising tool does not include automatic scheduling but the calculation of certain indices associated with the efficiency of the inspection, such as the number of indications detected in relation to the areas inspected, etc. Recommendations are issued regarding the modification of work scopes and complementary techniques that might help to assess component deterioration. Lifetime calculation is based on operating data and normally contemplates lifetime consumption associated with fatigue and creep, also taking into consideration the effect of corrosion and erosion on loss of thickness, and consequently on increasing stress. This system may be particularly valuable to the operation personnel, who might be able to determine which operating mode is most negatively affecting degradation of the installation, especially during operating transients, and thus be able to adapt the corresponding operating procedures to obtain minimum lifetime consumption. Greater difficulties arise when defects are detected and it has not been possible to eliminate them, since these will very probably be the defects most limiting the service lifetime of the component. For this reason they must be evaluated by means of fracture mechanics techniques. With a view to solving this problem, consideration is being given to the incorporation in these systems of Indication Evaluation Manuals, such that an initial approximation might be achieved with respect to the remaining lifetime of the affected areas and to the recommended re-inspection period. Indication evaluation manuals are based on the results obtained from the thermal-stress analyses, and consist of evaluation of a series of hypothetical indications representative of the problems associated with the component under study prior to inspection. Indications of different dimensions and locations are considered. Optimum management of industrial installations' inspections is a key factor in the overall management of the plant, as well as in extending its service lifetime. This optimum management is based on the preparation of suitable inspection plans focusing on the critical components and on the use of inspection techniques providing maximum reliability, as well as on prompt and efficient evaluation of the results for dynamic scheduling. In this respect, implementation of an inspection and remaining lifetime system is of fundamental importance, helping the person responsible for maintenance to efficiently manage inspections and providing scheduling and evaluation aid through the issuing of useful recommendations. In certain Spanish power and process plants where a system of this type has been incorporated, it has been seen that unavailability may be reduced by 1%. Consequently, this type of tools, which may also be integrated with other failure prediction or lifetime consumption monitoring systems, is essential in the increasingly competitive world. The advantages are clearly both technical and economic, and increase both availability and reliability, this ultimately allowing management of remaining lifetime to be optimised and the service lifetime of the installation to be extended.